I should tell you—I'm newly obsessed with BeHappy, which is the source of the image above. It's a collection of inspirational quotes which can be ordered in various format (poster, cards, etc.). I signed up for their email blast so I get a new quote in my InBox every day. If you follow me on Pinterest, I'm sure you've already seen a few of them on my quotes board. Which brings me to another "have you seen" tidbit. 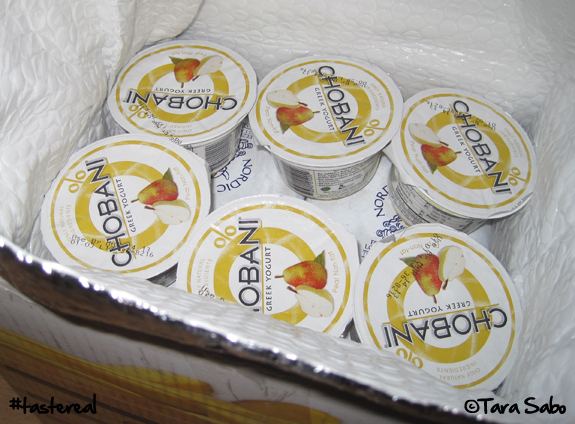 You've heard about the new Chobani flavors, right? Pear and Banana, just to name a few. 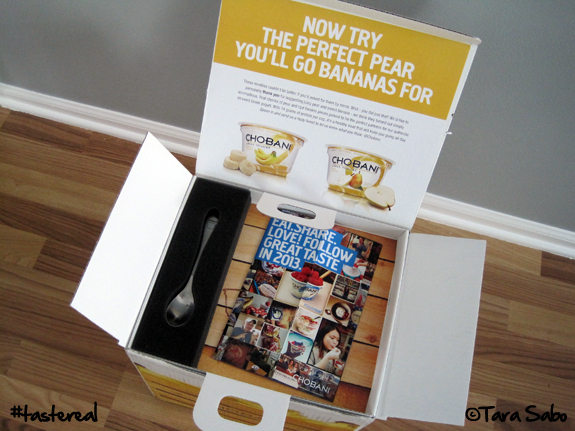 Reason #1: It's banana- and pear-flavored Chobani! Reason #2: The sweet packaging geeks out my inner advertising girl. I haven't cracked open a cup yet, but I've heard great things about both flavors and I expect to find them equally delicious. Banana, well...I love anything Banana. 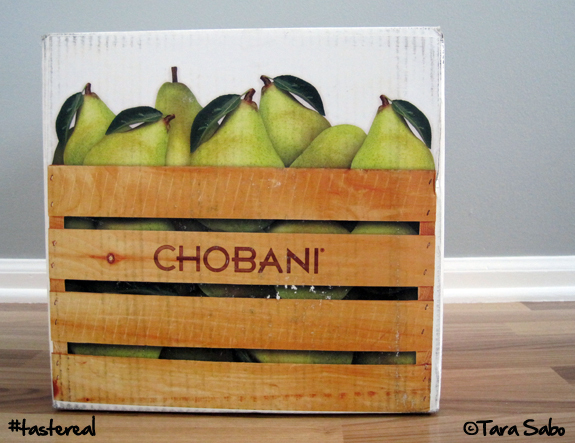 I'm a harder sell on pears, mostly because I can't stand the pear texture. They always seem a bit mushy to me. But I love the flavor, which is why I have such high hopes for this yogurt. Question: In what way have you risen to the occasion lately? What have you done lately that's really made you feel like you're living your life to its fullest? Don't forget to enter my giveaway! 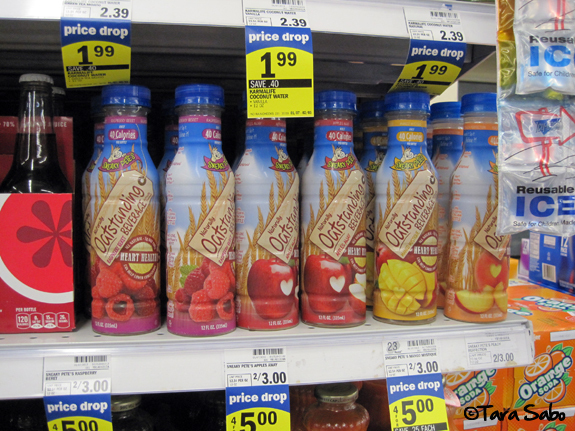 Win a month's worth of Sneaky Pete's Naturally Oatstanding Beverage! 1) Pick a parking spot that's somewhat far from the door. Don't be so inclined to snag the spot closest to the door. You are perfectly capable of walking a longer distance, right? Sure, it's cold...but what's a few more seconds outside? A few more seconds of activity, that's what. And it all counts. 2) Take the stairs. Sure, the elevator is an easy solution. But if you work in a smaller office building or need to get up to the second floor in a shopping complex, be real. Take the stairs! Your boots where made for walking, and your glutes will help them out. 3) Seek outdoor activities. Despite the cold, winter brings with it a ton of opportunity for outdoor activity. There are the obvious choices like skiing and snowboarding, snowshoeing and ice skating. And let's not forget about the sled. Grab your kids, maybe your grandkids, get bundled up and go. It's tough to walk up those hills, even tougher to pull a kid in a sled behind you. But just think of it as a great leg workout. Cardio, too. 4) Invest in a good fitness DVD. There are some really great options out there, but who wants to try them out when it's all sunshine and blue skies for miles? No one. So now is the perfect time. Hit up the fitness aisle at Target. Check out your local video rental place. OR, better yet—hit up YouTube. You'll find anything and everything on YouTube. Very simply, though. You have to just keep moving. I'm not talking about staying on your feet for 24 hours a day, but I am suggesting that you do what you can to avoid a sedentary life. And the above options are all good ways to do just that, but they're not the only way. Technically speaking, you should be getting at least 30 minutes of activity a day. If that 30 minutes is spent at the gym, hooray. But there will always be days when that's just not possible and that's when things like the above become important. A new study from Oregon State University, which I recently read about on Science Daily, suggests that "Taking the Stairs, Raking Leaves May Have Same Health Benefits as a Trip to The Gym." The study encourages people to "seek out opportunities to be active when the choice is available. For example, rather than sitting while talking on the phone, use this opportunity to get in some activity by pacing around while talking." 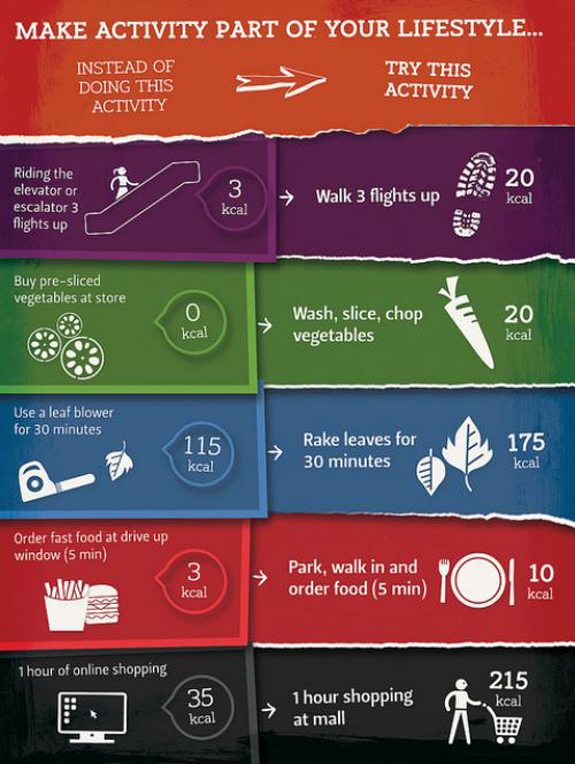 All of these little bouts of activity can add up to 30 minutes or more of activity. Question: What sort of things do you do...decisions do you make...throughout your day to ensure the max in activity levels? This is the story of yet another item that I repeatedly checked out at the grocery store without ever actually purchasing it. I think I wasn't sure if I'd actually like it, or maybe I just had other things to buy. So I'm sure you'll understand when I accepted a few free samples of Sneaky Pete's Naturally Oatstanding Beverage. Why not? Perfect opportunity. Besides, my curiosity was starting to get the best of me—what DOES oatmeal taste like in liquid form? Sure, I put it in my smoothies but never stands out as a main player. It just thickens things up while adding some fiber. So as a beverage all its own? Notice that one full bottle is a single serving. Most bottles this size are two servings in one. TRICKY! No need to worry about that here. Also notice how low in sugars this drink is. 5 grams is super low in comparison. Speaking of sugars—if you're wondering what erythritol is, it's a natural and calorie-free sweetener. You consume it via grape, pear and melon. Even wine and cheese, too. And I'm sure you're familiar with Stevia. Sweetener from the Rebiana leaf, natural as well. This, however, brings me to my one and only complaint about this beverage. It's a bit too sweet for me...but I'm not much of a sweet beverage drinker. That said, it's not to the point where I can't drink it. Honestly, the flavor is excellent. All of the flavors are: Apple, grape, mango, peach and raspberry. I'd definitely go for one of these over, say, a Vitamin Water or Gatorade any day. And if you head back up to that first picture I posted, you'll see that Sneaky Pete's is comparable in price to Vitamin Water and Gatorade, too. At 2/$3.00 in my store, I'd say that's a fairly great deal for something so delicious and good-for-you. I'll announce the winner on Friday, February 1, 2013. Be sure to follow Sneaky Pete's on Facebook to keep up on all things "oatstanding." Note: Sneaky Pete's did not pay me to write this review, but they did supply me with product to sample. All opinions are my own, as they always are. My daughter is a pretty good sleeper. She made it through the night around three months, and she takes a fairly long nap every afternoon. Well...most afternoons. Today, she didn't want anything to do with her nap so we got in a little more playtime than usual. And right now, she's enjoying some milk before she hits the hay until about 7:00AM tomorrow morning. We are a house full of great sleepers. And this, of course, is a very good thing. Sleep does wonders for the body, mind and soul. It really does. But it's also one of those things that can take second fiddle to so many other things like sickness, activities and time. Such is life, right? You can find this infographic and more at Greatist.com...if you're not already checking this site frequently, you should. Seriously good stuff. Question: Are you a good sleeper? What time do you go to bed every night? 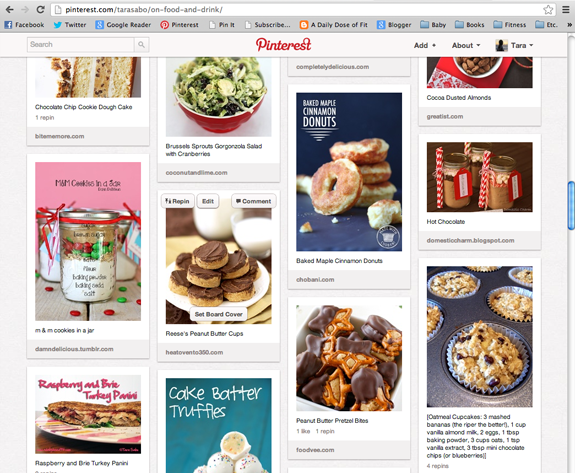 But I almost never, rarely do I ever go back to my pinned recipes and actually make them. I just don't. But I got two donut pans for Christmas, so I pinned a few donut recipes—and I actually tested one of them out today, the results of which were quite fantastic. Baked maple cinnamon donuts, compliments of Chobani. I know, right. Leave it to my favorite yogurt company to come up with my new favorite donut recipe. Seriously, I'm not sure it can be beat. I've wanted a donut pan for a really long time because I love donuts, but I'm not a huge fan of the calorie count that comes with them. So baking my own at home seemed like an obvious, awesome solution to the nutritional problem. And it is, especially when Chobani is involved. Don't forget that you can sub out higher calorie ingredients for Greek yogurt and get the same, if not better, results. So anyway, this is a Pinterest success story. Made furthermore successful by the fact that Chobani's recipe is highly adaptable. For example, you could switch out the maple syrup for honey and add blueberries. Is it tomorrow morning yet? I want breakfast. 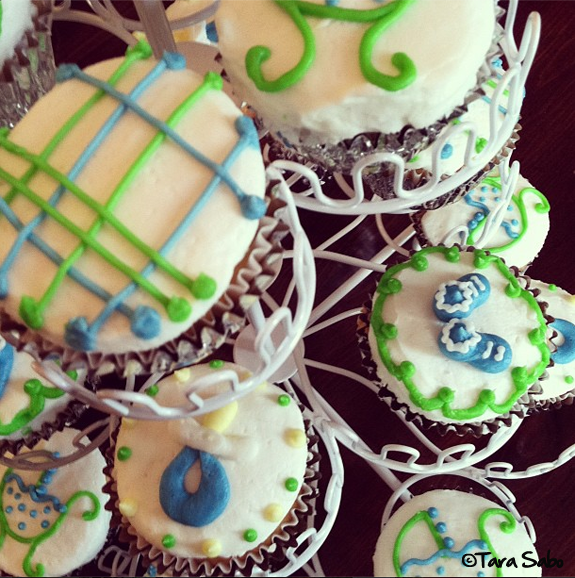 Question: What is your latest Pinterest success story? Question: How often do you take a rest day? What's your favorite way to spend it? Seriously, I can't say enough about this series of DVDs. I mean, I'm obviously partial to her because of her name—but she teaches a great class, she really does. Totally worth the investment if you're looking for some at-home yoga. Slowly make your way through the above, breathing deeply with each move while focusing on your core muscles in particular. It's not mean to be a fast workout, but a thorough one much like a yoga class would be. 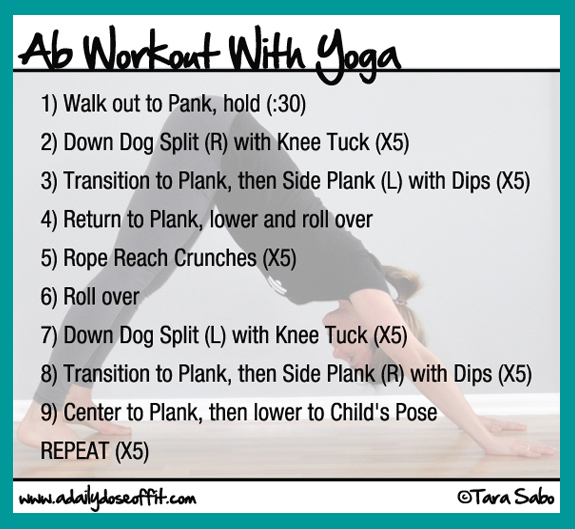 Repeat it five times through, and if it starts to get easy, extend the length of your planks. 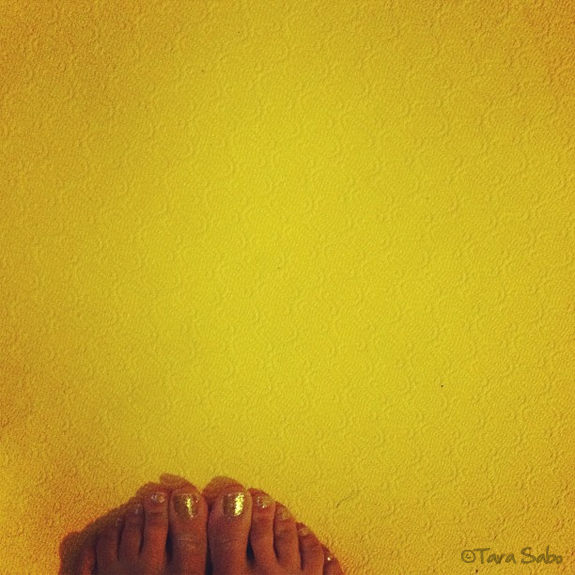 Question: What at-home yoga DVDs or resources would you recommend? We are a very milk-centric household right now. Hannah transitioned to cow's milk on a full-time basis on her first birthday and hasn't looked back which means we are buying an extra gallon (or more) a week now. She drinks whole, organic milk while we drink the fat-free version. She transitioned smoothly, as did I...unless you count the constant struggle to find shelf space for our growing collection of kid-friendly cups. We could get by with just four, but kid-friendly cups are so cute and I sometimes can't resist (such was the case with the Elmo cup, which can currently be found in Target's dollar bins). 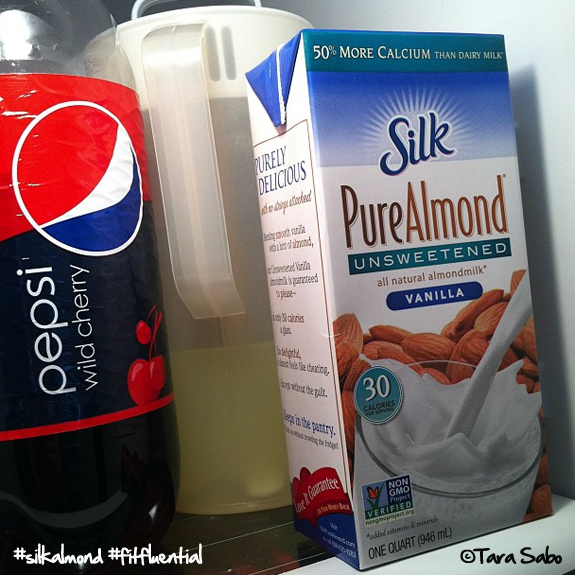 I also can't resist the occasional cup of almond milk. Silk Almond milk is not something I buy on a regular basis, but it remains one of those things that I treat myself to on occasion because I really like it. So I usually pick it up when the craving gets too unbearable, or when it goes on sale (or when 30 of my peers decide to blog about it). I like it in smoothies, in my oatmeal and sometimes in my coffee or cocoa. I'll even drink it straight-up. There are only 30 calories in a single serving, which is less than what's in a single serving of fat-free cow's milk. So that's cool. And, you know, it's made out of almonds so no saturated fats or cholesterol, either. It's just good stuff, I think. And, yeah...I have some fellow FitFluential Ambassadors to thank for triggering this latest craving blast. 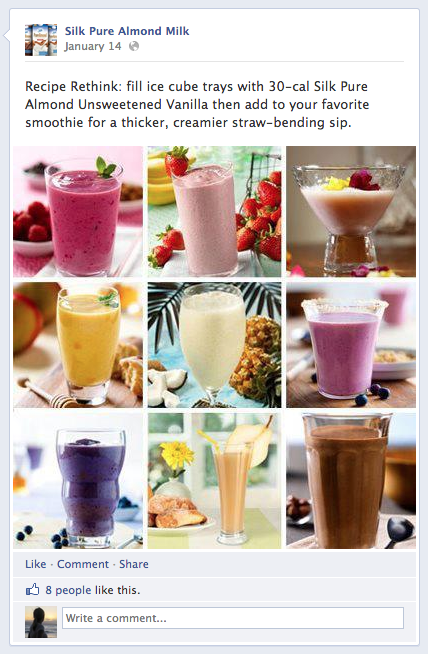 As I said before, 30 of them are working with Silk right now on a recipe campaign—you might have seen some of their creations already if you read any FitFluential Ambassador blogs or if you "like" the Silk page on Facebook. I do, and let me tell you, their recipes all look delicious. Well, at least the recipes that have been revealed. Silk is unveiling each of the 30 recipes on a rolling basis. They vary from desserts to drinks to savory treats. Heather of Heather's Dish created a chocolate-covered cherry smoothie that had me drooling. I didn't have all the ingredients at home, but a cup of Cherry Chobani and some cocoa powder go a long way toward flavorful when you combine them with some unsweetened vanilla almond milk. Someday, I'm sure Hannah will love almond milk like I do (I've given up hope on the husband, he's too picky). She likes just about anything—girl had pot roast for dinner and devoured it, but we haven't given her any nuts yet. She hasn't had any food allergies to date, but I'm nervous about this one because it's such a tough allergy to have. I doubt she's allergic, but you never know. So at the suggestion of our pediatrician, we're going to wait a little bit longer before we venture down that road. Question: What kind of milk do you drink, and what's your favorite way to enjoy it? FitFluential, LLC compensated me for this campaign. All opinions are my own. 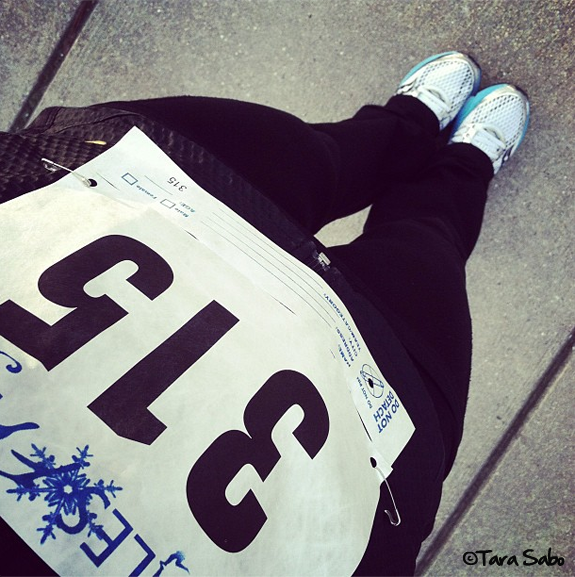 One of my goals, plans and resolutions for 2013 is to run a 5K in less than 23 minutes. Lofty for me, but totally doable if I push myself. (Isn't anything doable if we just push ourselves a little?!) So I took a shot at it this weekend at a race otherwise known as The Frigid 5K, which was held in a town near to mine. I ran it with a friend of mine (because it's so much more fun to run a race when you run it with a friend, I think). I crossed the finish line at 24 minutes and one second. Just shy of the top five in my age group, and just shy of my goal. But I'm still pretty happy with myself. The race started off on a really narrow, congested path so I had to dodge some people to break away. And I did so going up a hill. I hate hills Plus, it was cold and my lungs always burn when I run in the cold. But I found my stride after the first mile and hauled arse all the way to the finish line. Nice and fast, just the way I wanted it to be. My friend finish in 19 minutes and some change, and I think he was pretty happy with that as he should be. She's due in six weeks and I can't wait to meet my new nephew, otherwise known as Little Dude in my book until he gets here and she reveals his actual name. But let's be honest, I'll probably always call him Little Dude, right? Question: What's the fastest you've ever run a 5K? Seriously, it's one of those days. I just want to sit and do nothing. I don't want to think. I don't want to plan. I certainly don't want to clean. I am, without a doubt, completely unmotivated. And a little bit exhausted after this morning's 5:00AM client and 6:00AM Circuit Sculpt class. So basically, I've been up since 4:15AM. I'm not complaining, really. Obviously I love what I do and evermore obviously I know that tons of people out there would trade their full-time gigs for my part-time, stay-at-home gig in a heartbeat. But days like this, days that I don't feel like doing anything... Well, they drive me batty. Only because there is so much that I could be doing with myself right now while a certain little someone sleeps soundly across the hall. I'm usually pretty productive like that. I love being productive like that. Me in all my unmotivated glory. At least I'm wearing makeup. I mean, I work at a gym. I typically just throw on some deodorant and face lotion, comb the hair and call it good. MAYBE some lip gloss if I happen to remember it. But today, I'm wearing makeup. Obviously I was motivated at some point this morning. But you know what? Whatevs. I'm down with my lack of motivation. I don't often feel this way. I don't often LET myself feel this way. I'm more of a go-go-go'er. But not today. I'm making an exception and fully embracing my lack of motivation. This is an acceptable thing to do on occasion, dontchaknow. Sometimes we need to just stop. Our bodies love us for it, I really think they do. So cue the logout. It's Friday, y'all. 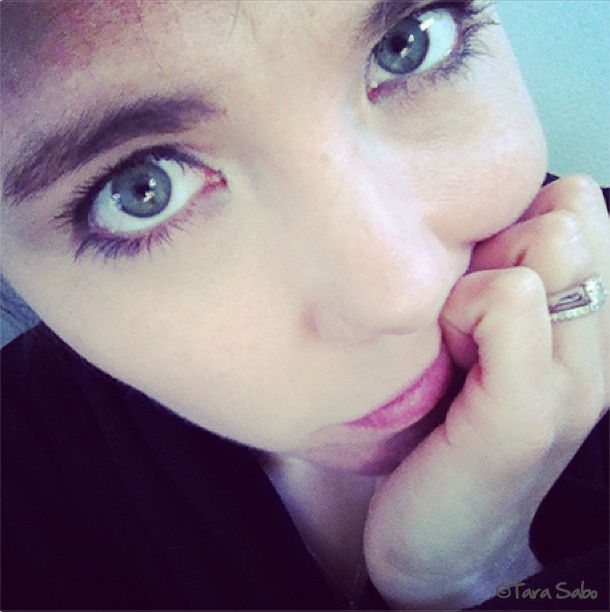 Question: How do you feel about being unmotivated? I hate it when I recommend something to you guys, only to find out that it might not be worth recommending. Furthermore, I hate it when things turn out to be not quite what they seem. I like to give people, things and businesses the benefit of the doubt. I like to be positive about things for as long as possible, hoping for the good to overcome the bad if the bad does exist... Sometimes it happens, sometimes it doesn't. Sometimes we wait for the whole story forever and it never comes. And so why am I bringing this up? Turns out, pvBody might not be the company I thought they were and there's a lot of negativity swirling around about them right now. They're that fitness clothing subscription service I sampled a few weeks ago. Anyway, you can read more about that by checking out the note I added to my original post. But really, what I want you to take away from today is positivity. There's a lot of negativity in this world. Some of it is warranted, some of it isn't. So do your best to be positive no matter what. Do your best to believe in people, places and things until you know for sure that it's not worth your time and effort. And most importantly, do your best to believe in your self today, tomorrow and every day for every second, every start to finish. You are worth it no matter what. You know this, right? Got good pinspiration? Use #pinspirationthursday! I'd love to see what's inspiring you. Question: What's your daily attitude in life? Aside from being positive, I'm constantly telling myself to slow down and enjoy it. Whatever "it" may be. I love grocery shopping. I love the adventure that is walking up and down each aisle and gathering what I need while checking out what I probably maybe might like to should try someday. Watching me from afar, you might think that I was a tourist in an art museum. I study the details. The nutrition information and ingredient lists on the items that intrigue my tastebuds. Sometimes this leads to a purchase. Sometimes I just add the item to my "someday" list. And that, of course, is where I placed belVita breakfast biscuits the first time I saw them. And the second, third and fourth time I thought about buying them. So when FitFluential offered up the chance to try them, well...you decide whether or not it was the food gods saying "here...will ya just try them already?!". So I did. I tried all of them. (No, not at once.) First impression? Tasty. And I'll share more personal impressions with you later. Right now, I'd like to talk about them from a brand perspective. Each box comes with five packets. Each packet has four biscuits. 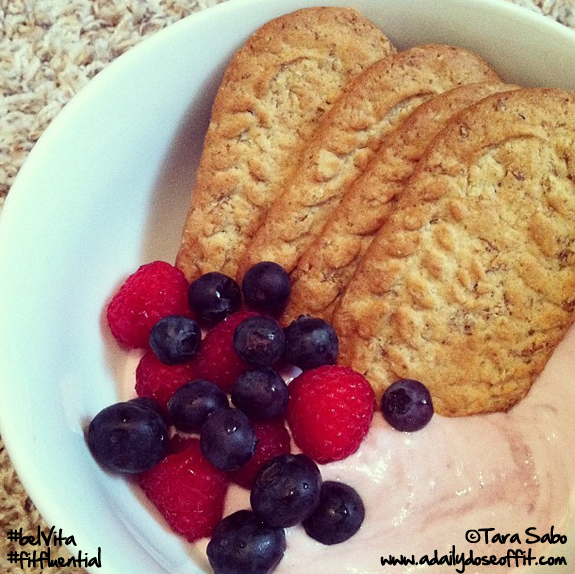 They're crunchy like graham crackers, and they provide 18-20 grams of whole grains per packet. Which is a good thing when it comes to breakfast. You want to start your day with carbs, and if those carbs are whole grains, then hey...ya did good. Consider yourself energized. In addition to the whole grains, you'll get three grams of fiber and four grams of protein. Carbs, fiber and protein...bada-bing, right? You need all three. And maybe even all five flavors to keep your taste buds interested: Blueberry, Golden Oat, Cinnamon Brown Sugar, Chocolate and Apple Cinnamon. Pretty standard fare, there. You'll find them, well...I find them in the cracker aisle at my grocery store and I'm assuming this is pretty universal. They retail around $3.69 for a box. Also fairly universal. But here's the thing. You can't just eat a package of belVita biscuits for breakfast and call it good. You have to balance them out with some fruit and dairy (like yogurt or a latte), too. Well-rounded, folks. That's what your meals need to be, regardless of when or where you eat them. Remember: Healthy bodies are not built in the gym, they're made in the kitchen. You've heard that before, right? If not, implant it in your brain. Live it, love it and learn it for best results. 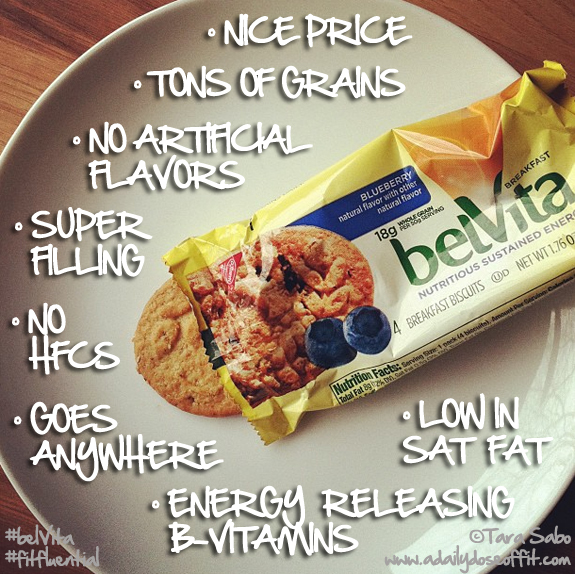 Also for best results, start your belVita adventure with the Golden Oat flavor. Alright, maybe that's stretching it a little bit...that's just my way of letting you know that Golden Oat is my favorite. They're all pretty delish, but this one takes the cake (biscuit?) for its simplicity. For its ability to mesh with just about any yogurt flavor out there. Hello, delicious vehicle for transferring yogurt into my mouth. We have a winner. But, come on, nothing is perfect. So here's what makes me go "hmm." There are always "things that make you go 'hmm'." Am I right? 1) The cookie crumbles, folks. This isn't necessarily a bad thing, but I don't need any help in the "messy eater" department. I do just fine on my own. 2) I kinda feel like the sugar content is borderline high. Like, on the higher end of acceptable. Then again, I usually look for snacks with ten or less grams of sugar. But I'm no dietician or nutritionist. So maybe it's fine. Just sayin'. 3) Texture? Kind of cardboard-y. See graham cracker comment above. So if you like graham crackers, then you'll be fine with these. Especially if you dip them in yogurt. 4) Lotsa fat. But these are sold as a meal, not a snack. So it makes a little more sense, I guess. We do kinda need a little fat in our diets. But still. 5) Gotta knock 'em for being a processed snack. Blueberry is a delicious biscuit, but if I have that packaged goodie or a fresh and homemade blueberry muffin in front of me, obviously i'm going with the muffin. But I mean, in a pinch, these will do. In fact, I'd be lying to you if I told you that I never at anything prepackaged. I'm always on the go, and I have a little one. Prepackaged comes in handy every so often. So when I do buy prepackaged things, they have to be good...and as good for me as possible. So I'd probably buy these, yeah. They're decent. 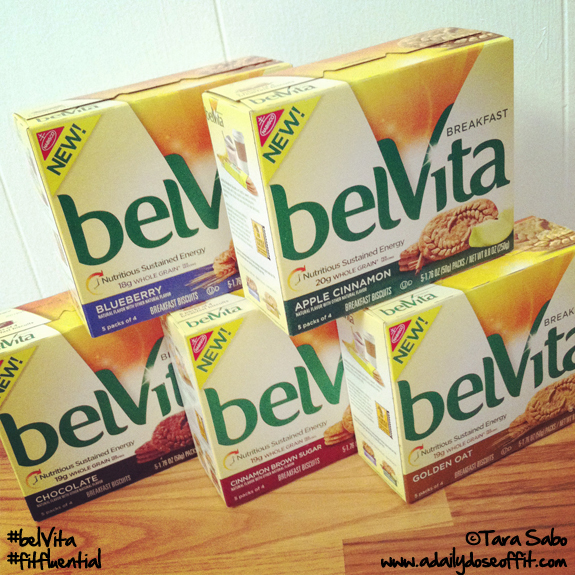 Question: Out of the five belVita flavors, which one would you eat right now if you could? And what would you pair it with (remember, think fruit and dairy)? This Archer Farms stuff is so good. I eat it plan, like...not even with butter. But I also like to eat it with banana slices and peanut butter—Honey/cinnamon/Chia peanut butter. I got a couple of requests for the recipe, but there really is no recipe which is a good thing for you. I started with a jar of Planter's (or store brand) dry roasted, unsalted peanuts and whirled them up in my food processor. I added one teaspoon of cinnamon and two tablespoons of Chia seeds, then I added two teaspoons of honey. It's not as sweet as you might think, and it only hints at the cinnamon flavor, but that's how I like it. Feel free to add more of everything if you want. That's the beauty of homemade nut butters. You can control the additives. You guys. I hit the denim jackpot. I'm not even joking. These jeans are incredible (and affordable). They're totally stretchy like leggings, but they fit and are thick like regular jeans. AND THEY ARE SO COMFORTABLE. Take a closer look at the waist. No buttons or zippers! I'm telling you. I had my mom try on a pair this weekend. She walked out of the dressing room and said, "Um...yeah." Sold, just like that. Go try some on. So for Christmas, I got this pitcher and it totally rocks my water with fruity goodness. I am SO BAD about drinking water throughout the day, but with a hint of strawberry and raspberry, it makes guzzlin' the stuff down a bit easier. Even my daughter chug-a-lugs it. 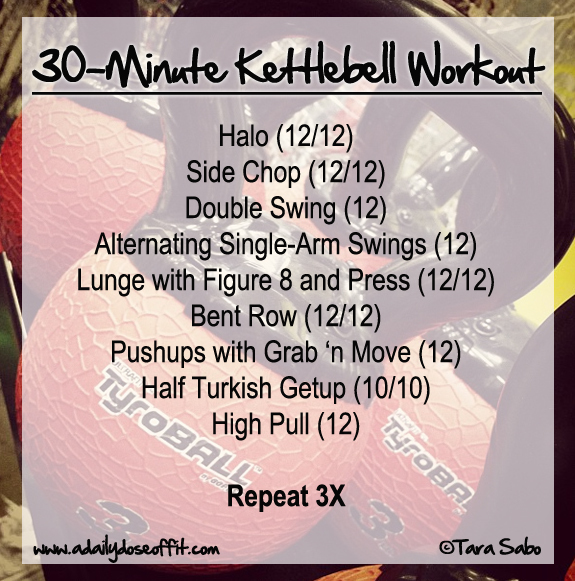 I am having so much fun with the kettlebell class that I teach once a week. It's a great workout, and a great group of people...today, we had ten in the class. We did windmills and good mornings, and I'm kind of newly obsessed with both moves. Such a great burn! Question: What's something new in your life that you're really loving right now? You might think the world is about to implode once I tell you that I haven't been eating much nut butter lately. But really, the world isn't—I just haven't. Only because I haven't really had the time to stop and make some, which is silly because it requires so little time and effort. I did buy a jar of almond butter a few days ago and...it's odd...I might be over almond butters. Or maybe it's just the brand I picked. One little bite of homemade honey/cinnamon/Chia peanut butter. Wanna learn more? Check out "That's nuts, man." Question: Other than homemade almond butter, do you have a favorite store-bought brand? I need to test out some new brands—I'll be so sad if I don't like almond butter anymore! I love almonds. Before we get to the aforementioned salad recipe, I must inform the following two people that they will be receiving $20 worth of free berries from Driscoll's. Hooray! 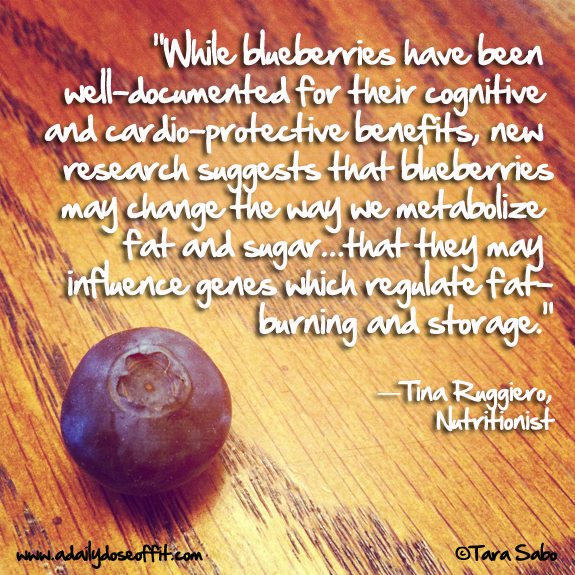 I'm pretty sure I'll be freezing some blueberries as soon as this post is up for all the world to see. Such a great idea...one that I always seem to forget about. Delicious, right? Quick note about kale as a salad green: She suggests letting it sit in the bowl for 15 minutes so that the dressing gets a chance to soften up the leaves. I don't know about you, but I have a hard time eating fresh kale because it's so rough, so this is a great idea. But asking me to wait 15 minutes to eat something so delicious is like telling me I...I don't know what, but it's not good. You agree?! So maybe try massaging the kale a bit before you dress it, like, literally give it a massage with your fingertips. It should soften up right quick. Seriously, follow Driscoll's on YouTube. They post a ton of great recipes. There exists a certain love-hate relationship when it comes to working out. We love the burn, we love the results...but we often hate having to put in the time. Let's be honest, we'd rather be socializing with friends and family or curling up on the couch with a television show. But seriously, NOT working out really shouldn't be an option. For health reasons, yes. But more importantly, there's something for every interest. 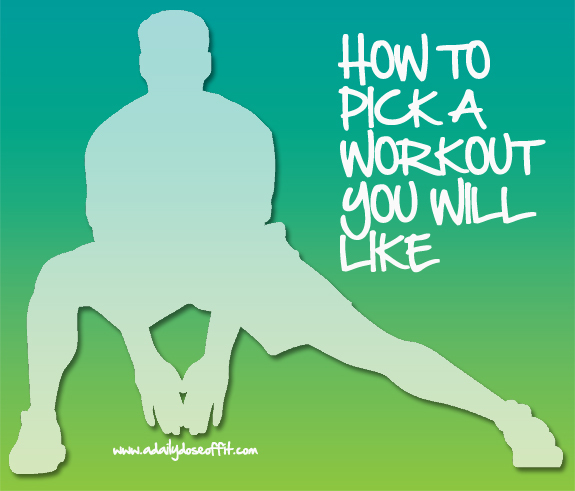 You should always be able to find a workout you like. It just takes some thought on your part. Some self-reflection and honesty. 1) AM I GOOD AT MOTIVATING MYSELF? If the answer is "yes," then you're lucky. There aren't a lot of workouts you'll have to immediately write off. 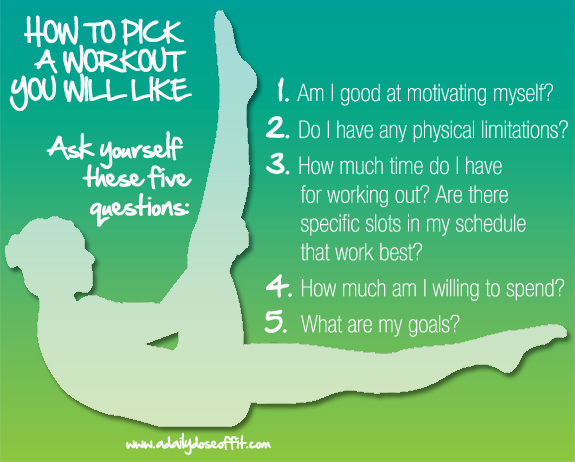 But if the answer is "no," then you'll want to consider group fitness classes or sessions with a personal trainer. Both of which hold some level of accountability over your head. Meaning, your trainer will charge you if you don't show up without reason and your classmates will notice when you aren't there. And many classes charge a fee. Who wants to waste money? "Not I," said everyone. 2) DO I HAVE ANY PHYSICAL LIMITATIONS? Sometimes our bodies simply cannot sustain certain types of physical activity because of injury or ailment. For example, if you have bad knees, then you'll certainly not want to take up running. Consult with your doctor, then consult with a personal trainer or group fitness instructor for further advice. They can help you decide what you might like and what, in essence, might be a recipe for disaster. 3) HOW MUCH TIME DO I HAVE FOR WORKING OUT? ARE THERE SPECIFIC SLOTS IN MY SCHEDULE THAT WORK BEST? Knowing how you might best incorporate exercise in your schedule is a great way to start the search for a workout you'll like. Particularly if you're interested in taking any group fitness classes or working with a trainer, both of which are very schedule oriented. But if these things don't interest you, then it's all about deciding how much time you are willing to take out of your day (or week) to devote to working out. For example, high intensity workouts can be done in 20 to 30 minutes, plus a warm up and cool down. You can get serious bang for your time buck in little to no time at all, maybe two to three times a week. But if you want to become a runner, if you'd like to incorporate more running, then you'll need to be flexible and available for a training schedule that will grow as your desired distance grows. 4) HOW MUCH AM I WILLING TO SPEND? If the answer is nothing, there's no need to despair. Many a great workout can be achieved using your very own body weight and not much else. But if you do have a budget, you can decide if you'd rather spend that money on a gym membership or a piece of home equipment—of course, you'll then have to decide which type of home equipment is best, which takes you back to the physical limitations you have and the time restrictions, too. 5) WHAT ARE MY GOALS? If you need to lose some serious weight, then yoga might not be the best choice for you at first. If you want to build muscle in a lean, mean way then you might want to consider working with weights on a regular basis or taking up a Body Pump class. Goals are easily achieved when you have the right mindset—and the right plan. Pick a bad plan and you'll lose motivation and interest. So knock things off the list that aren't in line with your goals. Now go, choose your adventure. Remember those books? Loved them. Today is the last day to enter my giveaway. Be sure you do...two readers will win free berries! Question: What workouts do you absolutely hate more than anything? Like, you won't ever do them. For me, it's anything in the pool...which is totally unfortunate. Don't forget to enter my giveaway. Free berries to two winners! Question: How's it going with the resolutions? Are you off to a great start? Tell me about your successes thus far. Today is one of those days that leaves me wanting nothing more than a blanket and some magazines. I'm tired for no particular reason, just tired. It catches up with me every once in a while, but I push on. For example, today is a yoga day and my goal is to do yoga once a week, I decided to go for a 20-minute strength and flexibility session from my Tara Stiles DVDs in lieu of not doing anything. 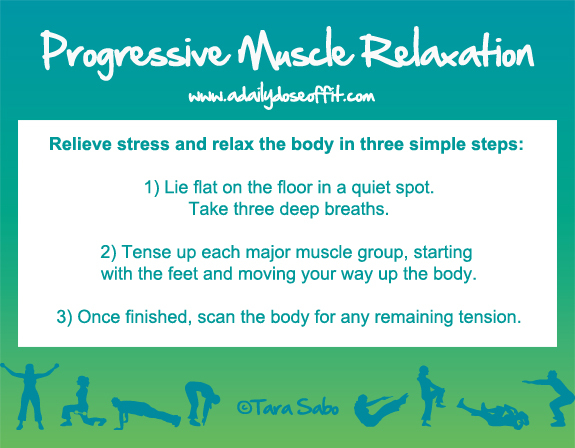 Progressive muscle relaxation is nothing more than tensing and relaxing every muscle in your body, starting with your toes and working your way up to your head. It's best done lying down in a quite place so you can really focus on and feel what your muscles are doing. 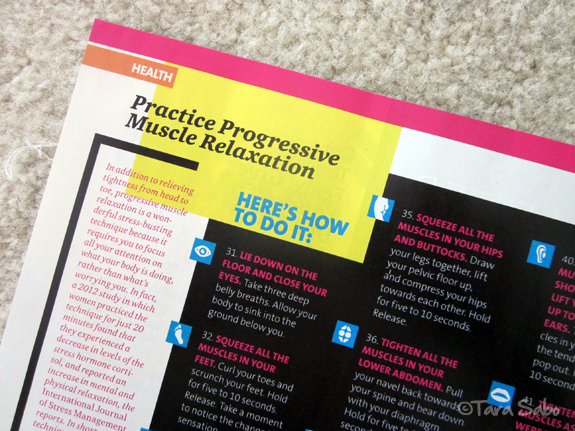 You basically squeeze and release each muscle group, letting yourself sink into the floor for total relaxation. Deep breathing, of course, makes it even more effective. And once you've worked your way over your entire body, you can go back and re-squeeze any muscle groups that are still tense. In the end, according to Oxygen, you'll feel like "a relaxed, cooked noodle." In the end, I could have fallen asleep. I was that relaxed. Give it a try next time you feel stressed and/or in need of a moment. To quote Oxygen again: "A 2012 study in which women practiced the technique for just 20 minutes found that they experienced a decrease in the levels of the stress hormone Cortisol, and reported an increase in mental and physical relaxation." Question: What's your favorite stress-bustin' technique? I heard "that was a good one" as I was picking up the studio after class. You'll have to let me know if you agree. Remember, work at your own pace—and always consult your physician before starting any rigorous and overly physical activity. I like giving you workouts, but I'm totally not prescribing them to you as I would my class or my clients. Please be careful, and proceed at your own risk! I'd hate for you to get hurt! I can watch the friends in my class, but I can't watch you. So I have to trust you to be smart about your use of my workouts. That said, I think I've had my fill of exercise for the day (believe it or not). I taught the 6:00AM Spinning® class today. We've been off for two weeks because of the holidays, so it was nice to get back in the saddle in an official manner. And I think I've finally gotten the hang of clipping in and out of the pedals with my new shoes. The first time I taught class in them, I had to get help with that. My local newspaper puts out a Health Monthly section, and yours truly is on the cover of it. I got called to the club on a whim last week, thinking maybe I'd make some small little callout in the guts of the report, but no. I'm smack dab on the front in all my no-shower, no-makeup glory. Bah! Needless to say, people had fun with me at work today. "Wow, we're taking class from a celebrity today!" "Can I have your autograph?" "You should have shaved your armpits." That last one might be true if you look close enough. Thankfully, I'm wearing a t-shirt just in case. Ha! Question: Have you ever felt like a celebrity? When? Was it fitness related? It's right about this time every year that my craving for fresh fruit really kicks in. I'm one to frequent the farmer's markets in favor of local produce, and this past summer I paid for a share from a farm nearby, so I never lacked in Mother Nature's finest. But here I am, living in Michigan where the ground is frozen and the veggies are shipped in. Sure, that makes them more expensive, but I don't mind paying a little more for something healthy—and fresh fruits and veggies certainly qualify as healthy. But when Driscoll's offered to send me some coupons to snag some berries, I did a little happy dance and promptly accepted. I mean, who turns away berries? Blueberry and raspberry smoothies are my favorite...well, one favorite of many. I would have added strawberries, too but my grocery store was out. 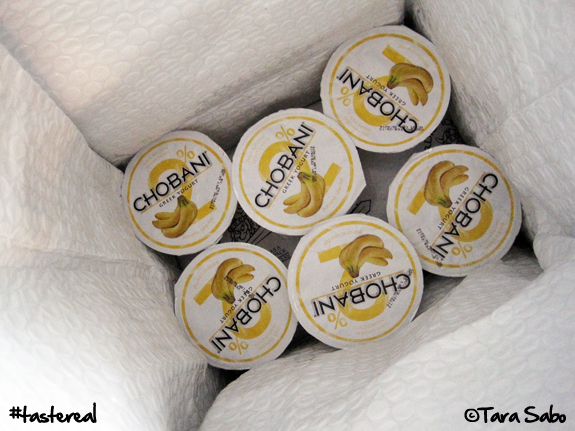 And, well...you can't make a smoothie without some banana and a tub of Cho. I figured Mango would be a nice addition to the lineup. Not pictured: Four ice cubes and a splash of milk. 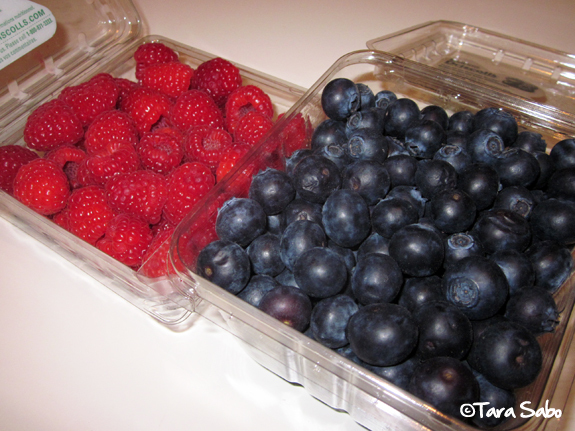 So with that, I encourage all of you to add more berries to your daily dose of healthy intake. And lucky you, Driscoll's is willing to send two lucky Daily Dose readers $20 in coupons to purchase said berries. Two readers, $20/each. Winner and winner. All you have to do is leave a comment below: Tell me what your favorite berry is and how you like to eat it. I'll pick the winners at random on Friday, January 11, 2013 and will announce them on Sunday, January 13, 2013. And just so you know, they are good for any clamshell of Driscoll's berries (including strawberries, blueberries, raspberries and blackberries). 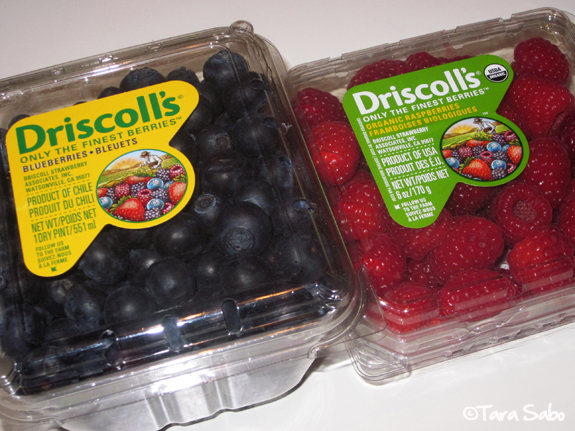 Follow Driscoll's on Facebook, Twitter and Instagram to keep up on all the berry action. Note: Driscoll's did not compensate me for this review. They sent me coupons that allowed me to purchase the berries above. All opinions are my own. Time to make #mycommitment to 2013.